The Friday, June 20th show at The Vogue Theatre was everything one could hope for. I was already keen to hear John Scofield, but to hear Martin, Modeski, and Wood was a wonderful bonus. The opening act, the Gordon Grdna Trio, featured Grdna on electric guitar and acoustic oud, Tommy Babin on bass, and Kenton Loewen on drums. The trio played with an extraordinary intensity and their rapport was remarkable. While Grdna did not have an overwhelming stage presence, his fingers flew over the fretboard, recalling at times the work of ‘80s guitarist, James Blood Ulmer. Much the set was inspired, though a couple of the oud pieces seemed rather aimless, and the end of the set sounded at best like inspired noise. Babin played like a man possessed and was able to extract overtones on his acoustic bass that I had never heard before. Chris Wood from the headline act, who alternated between acoustic and electric bass, was able to do the same on electric. Even before the headline act, there were a few very enthusiastic audience members, suggesting that some people were already a few tokes to the wind. Indeed, by the end of the concert, The Vogue fairly reeked of pot smoke, despite being an officially non-smoking venue. Martin, Scofield, Modeski, and Wood totally lived up to my expectations. Their split-second timing was spectacular, the arrangements incredibly inventive, and their ability tune in to one another divine. Martin (on drums) and Wood (on bass) provided an extraordinary rhythm section, with Wood anchoring the proceedings and Martin supplementing his kit with all kinds of percussion instruments. 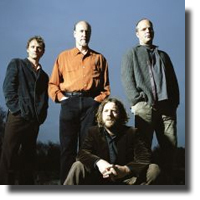 While they took their share of the spotlight, most of the solo work was provided by Modeski, alternating between piano and B3 organ and other keyboards, and Scofield on electric guitar. I particularly loved the way Scofield, regardless of the tempo of the piece, sliced and diced the melody and rhythm, slipping in notes at odd intervals and adding harmonic counterpoints. He is an exciting and confident player who rocked out for all the world like someone’s ever-so-cool grandfather. Their funkiest number sounded to my ears like a cover of Booker T and the MGs’ “Hang ‘Em High.” Technically speaking, funk operates in 4/4 time, but what puts the fun in funky is the way the beat is attenuated and the different instruments set up a complex cross-rhythm. They certainly achieved this on this extended jam. Martin was an extraordinary drummer, full on from the first flick of the sticks. And Wood got interesting sounds out of his acoustic bass, at one pressing a stick against his bow that produced sounds like a theremin. After a set that lasted well over a half an hour, they ended and then encored by playing a number from Ray Charles. All in all, a very satisfying show.